Luang Prabang, located in the north of Laos, lies in the heart of a mountainous region and is built on a peninsula formed by the Mekong River and the Nam Khan River. The UNESCO town is one of the most popular stops in a backpackers route through Laos. Luang Prabang is the type of place that you could easily spend a few extra days in, it has a magical atmosphere about it that is totally unique from the rest of South East Asia. Each morning, just before sunrise, the locals and tourists alike line the streets of Luang Prabang handing out food to the local monks. This food is all that the monks are allowed to eat throughout the day. It is a beautiful, traditional ceremony that has been conducted in Laos for years and years. We read all the rules here on how tourists should behave when participating in the ceremony to stay respectful. We woke up early and walked to the street outside of our hostel, we were the only tourists there. Upon seeing it with our own eyes we immediately felt as if we were intruding on a sacred moment between locals and monks. Whilst we were fascinated and amazed we also felt awkward, as if we didn’t belong. We stayed for only a short time before returning to our room to catch a few more hours sleep. 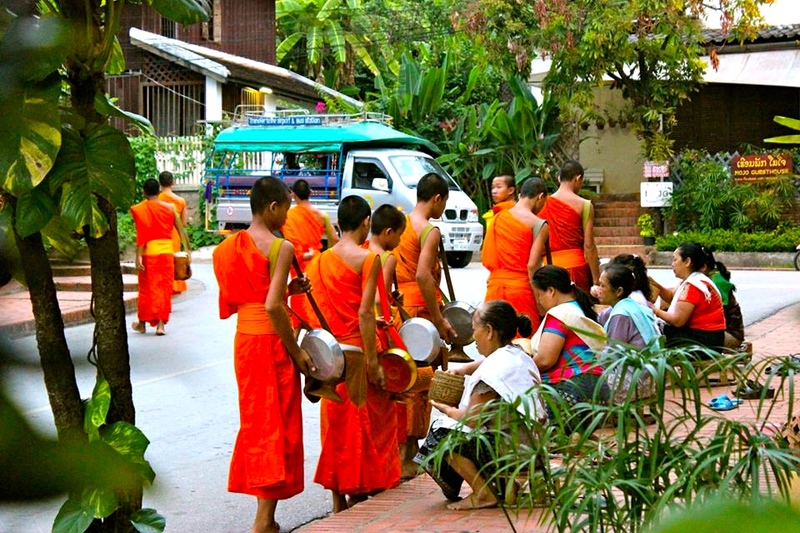 Despite having those awkward feelings I really recommend waking up early and observing the Alms Giving Ceremony, even if for just a few minutes, as it is such a unique cultural experience. Laos was once occupied by the French and so the Lao people learnt how to make perfect pastries and breads. 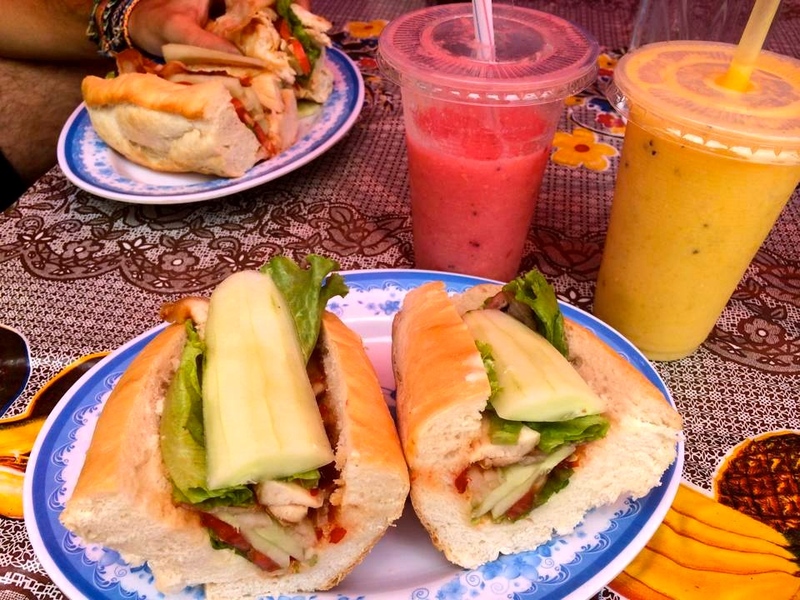 It’s been almost two years since I was in Luang Prabang and I still think about the delicious baguette’s there, they are truly the best sandwiches I have ever had. In the main square in town you’ll find many stalls selling these tasty sandwiches which can be filled with toppings of your choice. I highly suggest grabbing a fresh fruit smoothie with your lunch (my favourite was the passionfruit, pineapple and mango). In total your lunch should total around $3 and I promise you’ll go back daily, they are that good! This bar/restaurant is a favourite among travelers. It has everything from delicious and healthy food, beautiful scenery, yoga classes, eclectic music and a buzzing atmosphere. Their motto ‘zen by day, groovy by night’ is the perfect way to describe Utopia. In the day you can go and relax and at night it is the best place to party and socialise in all of Luang Prabang. Check out their website to learn more about why you can not leave Luang Prabang without a visit to Utopia! The night markets in Luang Prabang is one of my favourites in the whole world. Instead of designer knock offs my idea of market heaven is markets filled with beautiful, hand-made pieces that are completely different to anything you’d find at home. In particular I love homewares – give me a market filled with cushion covers, blankets, rugs, plates etc and I am a happy girl. 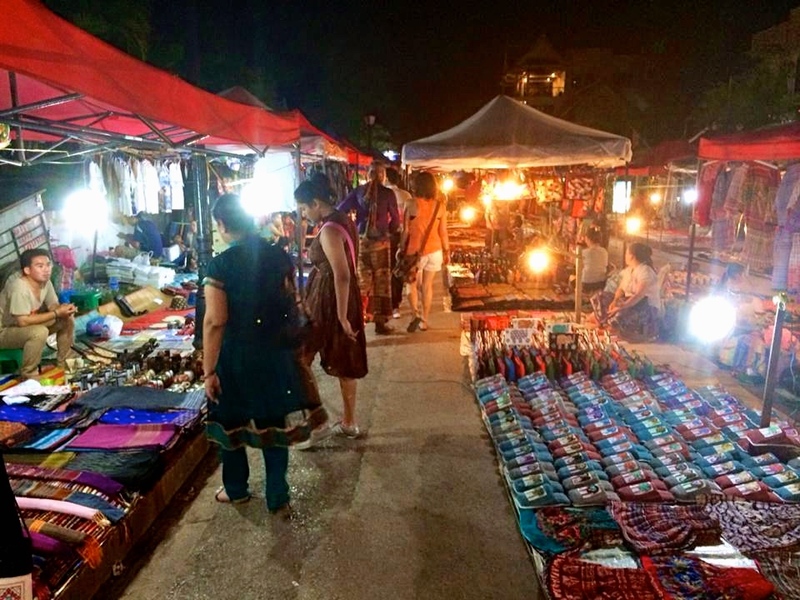 The Luang Prabang Night Markets has all that and much more. Related Read: The Best Markets in South East Asia! The topic of Elephants and Tourists in South East Asia is a heated and debated issue. I have seen many places that promote elephant rides on wooden chairs etc that I am totally against (read this). I am also aware that not all Elephant Parks are bad, this one in Chiang Mai is a perfect example. 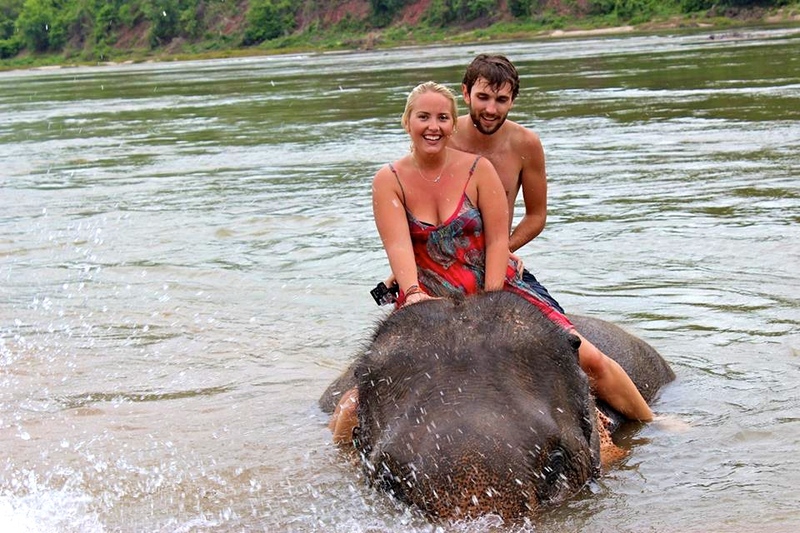 I had heard wonderful things from so many animal loving tourists about a place in Luang Prabang where you could bathe the Elephants in the Mekong River. After a lot of indecisiveness we decided to give it a go and I am so glad we did, it was truly one of the best days of our travels through South East Asia. 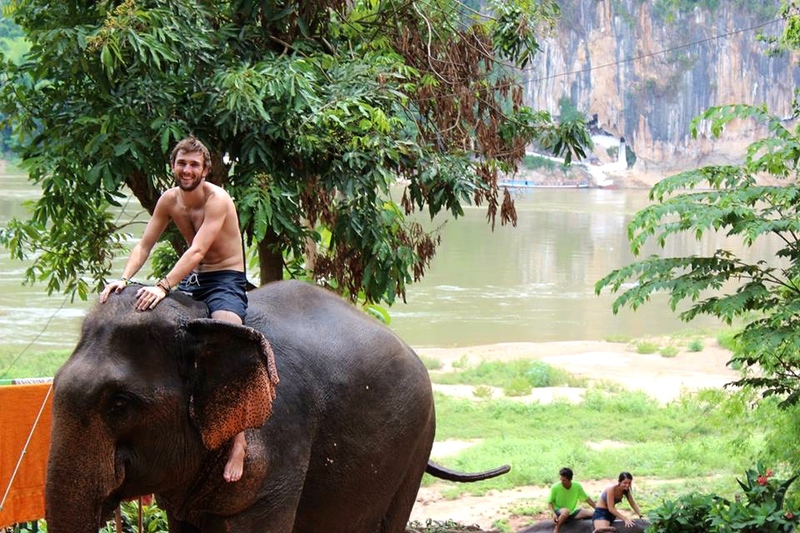 After learning a few words in Laos we would ask the Elephant to lie down as we hopped onto the Elephants bare back. We would then tell the Elephant to walk down to the river, perhaps 100 metres away where we proceeded to spend around two hours bathing and playing with the cheeky Elephants. They loved it. As soon as we would take them back up they would throw dirt on themselves so they could be taken back down to wash again. I was a bit skeptical on what to expect but the Elephants truly did seem happy. Obviously this is a heated topic, not all readers would agree. Visiting the Kuang Si Falls was the highlight of our time in Luang Prabang. It is rated #1 on TripAdvisor for good reason. It cost us 50,000 Kip (around $6 each) to hire a Tuk Tuk driver for the day. The falls are about an hour and a half drive from town. Once you arrive you pay a 20,000 Kip entrance fee ($2). We were delighted to find a Bear Sanctuary, Free The Bears, inside for rescued Sun and Asiatic Bears. The non-profit organisation was founded by an Australian woman, Mary Hutton, who wanted to stop the abuse of Sun and Asiatic Bears from being held in captivity and milked daily for their bile (that’s used in traditional asian medicines), after watching a segment on A Current Affairs television program in 1993. Since then she has not only saved thousands of Bears throughout all of Asia from this torturous act but also educated and brought awareness to the locals on why this practice needed to stop. It was so lovely to see the Bears being looked after so well. The enclosure had a natural stream running through and their were a range of entrapments filled with fruits so the bears still needed to use their hunting skills to eat. After the Bear sanctuary you’ll find the beginning of the stunning Kuang Si Waterfalls. It consists of about ten sections of waterfalls, each one more beautiful than the last. I have seen a lot of waterfalls in my travels but none as beautiful as Kuang Si, the milky blue is so unique and gorgeous! The water is also the coolest and most refreshing we found in Asia so it was a great spot to spend a few hours swimming. PAK OU CAVES – It sounds cool in theory. 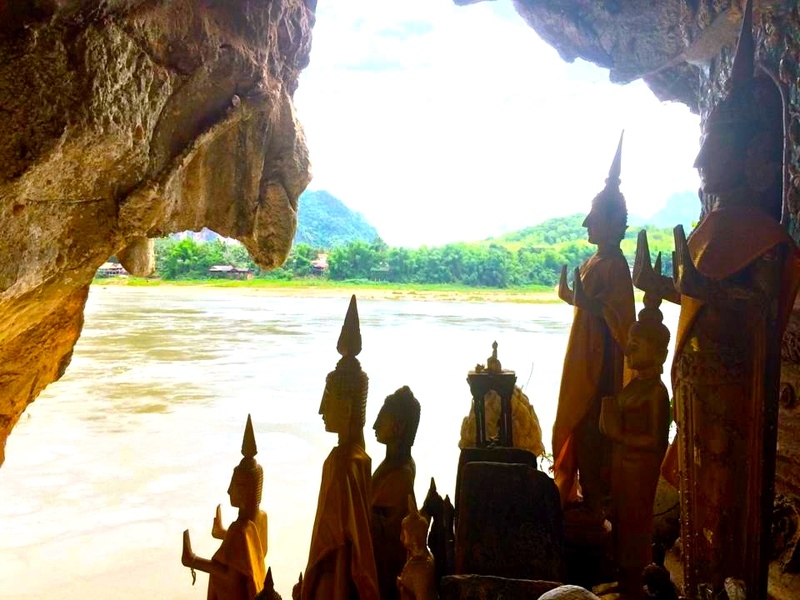 Once you enter the caves, after climbing hundreds of steps, you walk into a small cave filled with thousands of Buddha statues overlooking the river. Sounds really fascinating, I know. But alas, these Buddha statues were small statues, some as small as my finger, not huge life-sized statues I was expecting. To me it just felt like they’d built it simply for tourism, as a weird and strange place that would attract curious and excitable travelers. After all the rave reviews I was hugely disappointed by the Pak Ou Caves. WHISKY VILLAGE – I was expecting to see how the Whiskey was made or at least something a bit more exciting than stopping on the side of the road next to a street stall selling Whiskey. 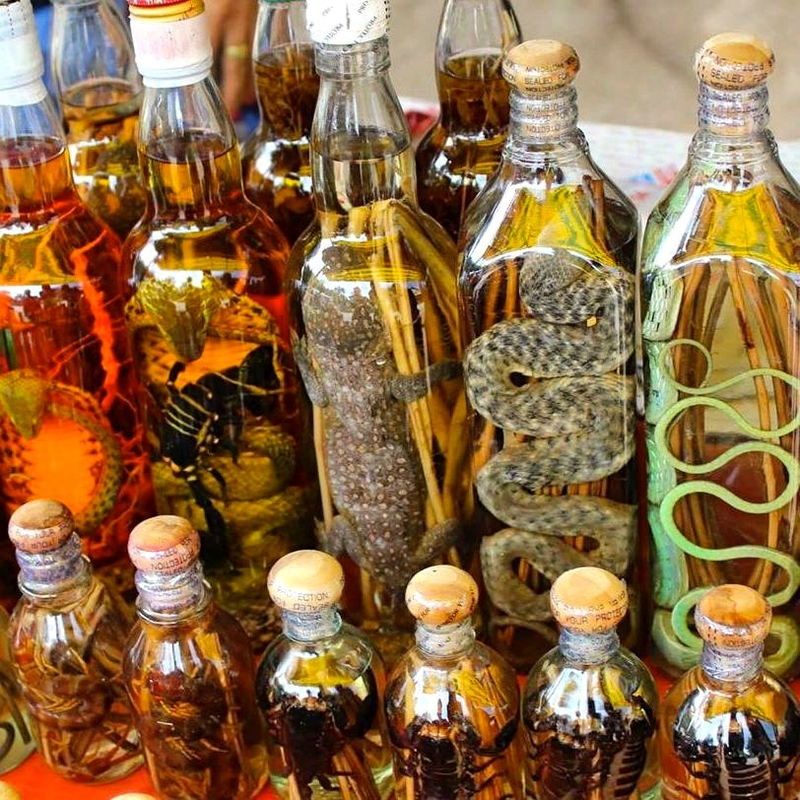 The Whiskey was interesting to look at though, bottles filled with Whiskey all accompanied by an animal of some sort – Snakes, Lizards, Spiders and Scorpions. But I felt it was quite cruel. Cruel that they’d kill these animals purely to create an attraction weird enough to make money. Unless there is an incredible tour that I somehow missed out on I don’t recommend a visit to the Whiskey village. 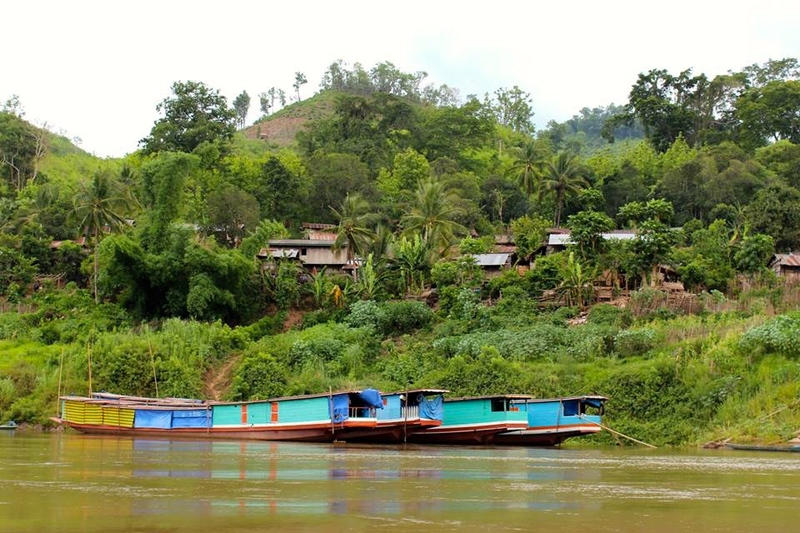 Most travelers arrive from Chiang Khong, Thailand via a Long Boat. We made our way to Chiang Khong from Chiang Mai via a shuttle bus that we booked there. The shuttle bus was to take three hours but ended up taking close to seven. 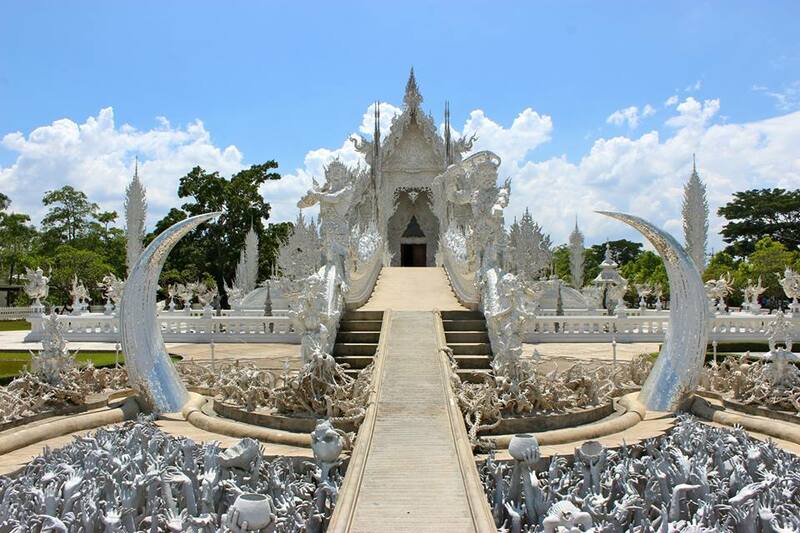 We did however get to stop at Chiang Rai briefly to visit Wat Rong Khun Temple which was a nice surprise. Unfortunately we didn’t get to go inside due to earthquake damage but it was quite bizarre looking from the outside. We had to stay the night so we could cross the border the next morning. There isn’t much to do in Chiang Khong so don’t plan to stay longer than a night. We left at 7am the next morning and made our way to the border. We had been told that it was a complicated process but we found it quite smooth. We handed in our passport and departure card to the Thailand border control, got our stamp and made our way to the bus to take us to the Laos border (the bus cost 25 Baht). We then exchanged currencies, filled in our Visa on Arrival Forms, Paid the $30 USD for the visa and an extra $1 because I didn’t have a passport photo on me (they didn’t take my photo though, apparently the money suffices). The process in total took about thirty minutes. We then caught a Tuk Tuk to the slow boat pier where we purchased tickets and waited for the boat to depart. They charged us a steep 30,000 Kip (around $30) for the boat but prices were non negotiable so we had no choice. 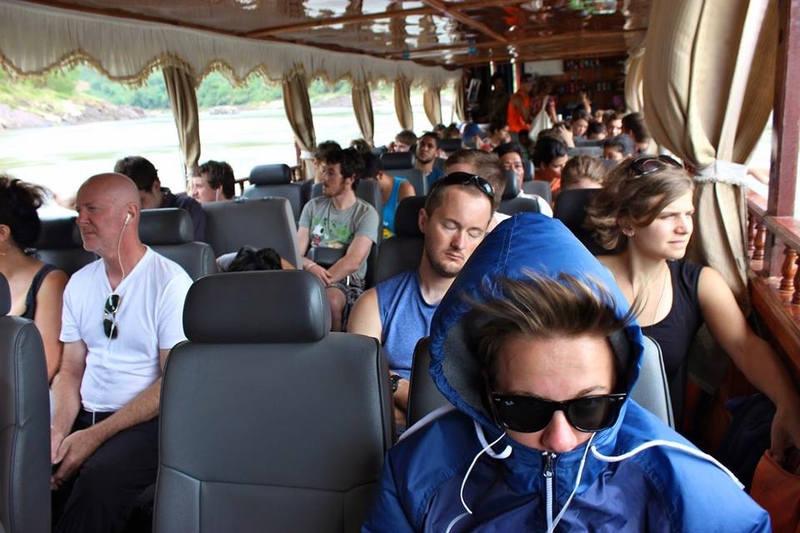 Note: you could catch a 24 hour bus ride from Chiang Mai instead for $55 but the slow boat is truly a right of passage and 90% of people choose this option. I definitely suggest taking enough water and snacks to get you through the day. Do not take the speed boat option, it is super dangerous and will require you to bring a motorbike helmet! There you have it! 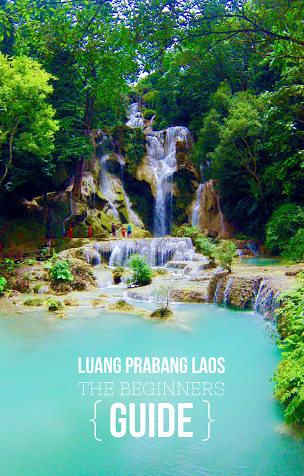 Everything you need to see, do and eat in Luang Prabang, Laos. It is one of the coolest little backpacker towns in South East Asia but be sure to get there soon before it changes forever! Over to you! Have I missed your favourite thing about Luang Prabang? Let me know in the comments below so I can see it next time! sound like a place you would like to visit? I loved the Kuang Si falls and the almsgivingceremony was an amazing experience.